DHANTERAS – beginning of the festivities of Diwali – All About India ! 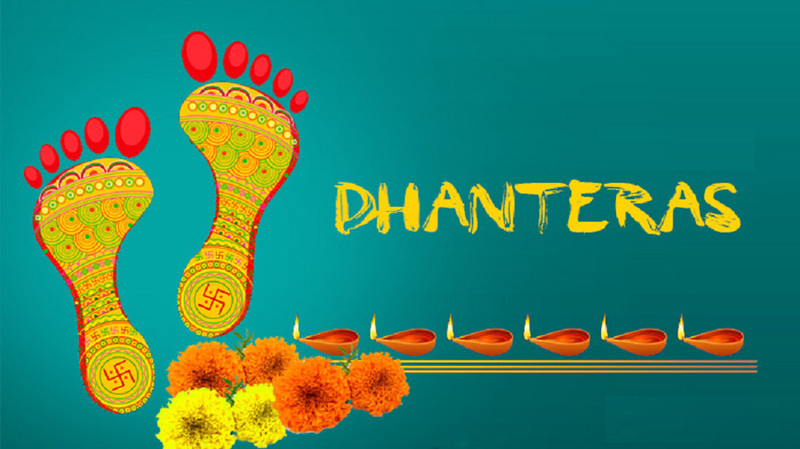 INTRODUCTION – “Festival of Dhanteras” is also known as Dhana Trayodashi or Dhanvantari Trayodashi. The word “Dhanteras” is derived from the two words Dhan (means Wealth) and Teras (means Thirteenth) and it is celebrated on the thirteenth lunar day of Krishna Paksha in the month of Ashwin. Dhanteras is one of the main part of the festival of Diwali as it is known as the beginning of the five days festivities of Diwali (Diwali is one of the major and most important festivals of India). PREPARATION – Preparation of this festival starts from a month or 2 months ago, people renovate their business place and make them new, better and clean. On this festival of Dhanteras people decorate their place of business by making entrance colorful with the help of lights and rangoli and welcome the goddess of wealth and prosperity, all lamps are kept burning during whole night. TRADITION – To celebrate the festival of Dhanteras, people buy gold and silver because it is considered as auspicious to buy these metals on this day. Every family is not able to purchase gold and silver because these metals are too expensive, so they buy atleast one or two utensils. It is believed that any form of precious metals or new Dhan is a sign of good luck. Previous “Delicious+Yummy+pocket friendly” food spots in Delhi !